Are You Smarter Than a Guardian Subeditor? The Guardian news quiz is too long, but it’s worth taking just for the laughs. 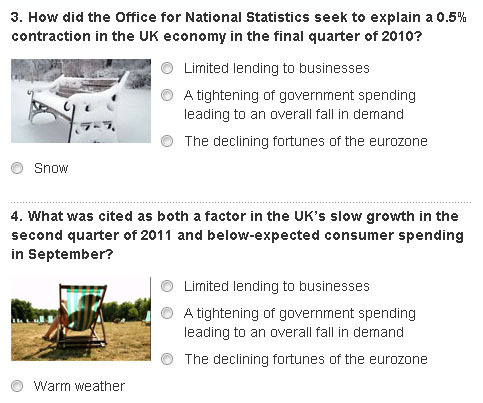 Even though this pair of questions refers to fairly arcane British trivia, I assume you can get the right answers. The pictures should help too. Question 19 caught me in just the right mood and made me laugh too. Overall, though, there were too many UK-specific trifles for me to do well. Also too much random stuff I just didn’t know. I only got 34 out of 55 right, so you should have little trouble beating my score.